Dentures are removable, prosthetic dental appliances (sometimes known as false teeth) that are fabricated in a dental laboratory for patients that have suffered tooth loss due to any number of reasons. Dentures are commonly prescribed and utilized to replace missing teeth and the surrounding tissues. The first dentures were crafted in porcelain in 1770 by a French apothecary, but it wasn’t until 1820 that high-quality porcelain dentures were mounted on 18-carat gold plates by a goldsmith and dental manufacturer in London. At present, dentures are custom-crafted in hundreds of shapes and tooth colors to resemble your natural teeth so closely that most casual observers cannot tell you are wearing them. Additionally, dentures help improve natural chewing and speaking ability, provide support for the lips and cheeks, and even enhance your natural smile. There are two commonly prescribed types of dentures: complete dentures and removable partial dentures. 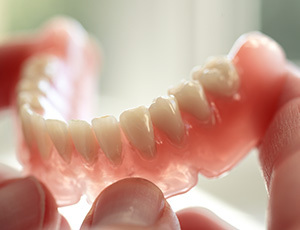 Complete dentures are utilized in cases where all of the teeth are missing. Removable partial dentures are recommended to fill in the spaces created by missing teeth when some of the natural teeth still remain. Partial dentures also help prevent other teeth from shifting and impacting the natural mouth shape. Dentures are extremely durable appliances and will benefit the wearer for many years. However, as with many dental appliances, dentures are not indelible and may have to be repaired, adjusted, or re-fabricated at some point in the future. A proper denture fitting may involve a few appointments to Premier Dental Care. Dr. Bakhtyari insists that all of his patients receive highly accurate measurements and impressions (molds) that are used to create your custom-crafted denture. A “fitting” appointment and some adjustments may be necessary to ensure a proper, comfortable denture match. During your denture fitting appointment, Dr. Bakhtyari will give you special care instructions for your new dental appliance. Regular brushing, flossing, and dental visits will add life to your teeth and any dental restorations, as well as increase the life of your dentures.